MormonInfo.org - FAQs - Why do you stand out in front of our temple to do your ministry? LDS don't stand out in front of your church. The simple answer to this question of why I minister in front of LDS temples is because I like to, and I fail to see what is wrong with it. Now I also do other forms of ministry. I go in front of high schools. I go to minister door to door. I minister at BYU. I even do relational ministry with my LDS friends (who, by the way, respect what I do with my confrontational street ministry in challenging people to think about their faith). 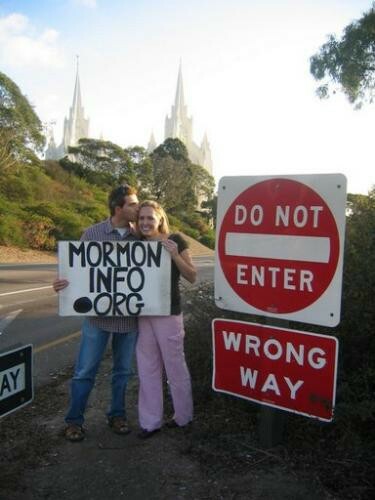 But I primarily love being out in front of LDS temples for various reasons. First, I think it is a good place to meet people. Of course it is a great place to meet LDS people, but it is also a great place to meet people from various religions. This breaks the monotony of talking to LDS all the time. These people from differing religions need the Lord too, and they also need to be inoculated (as do unsuspecting Christians) from joining the LDS cult. Second, the temple is typically where more people will see and hear our message. We simply can reach more people than if we spend an entire afternoon going door to door, for example. Third, the Apostle Paul told us to emulate him as he emulates Christ (1 Corinthians 4:16, 11:1). Paul's custom was going to the synagogues to reason with the Jews (e.g., Acts 17:1-3). Christ Himself also went to a place of worship to persuade people (e.g., when He would cleanse the temple of its robbers, and debate with the Pharisees). As for LDS not standing in front of our churches, I wish they would. It would really show me how concerned they were about us. The fact of the matter is, LDS are not as pressed to preach to people as I am. LDS generally believe that after this life most people will go to spirit prison where they will be taught the LDS gospel and wait for someone living to be baptized for them. This is all so that people may be converted in the afterlife. My own view is that of Hebrews 9:27: "And as it is appointed unto men once to die, but after this the judgment," and ironically, the Book of Mormon, "For behold, if ye have procrastinated the day of your repentance even until death, behold, ye have become subjected to the spirit of the devil, and he doth seal you his; therefore, the Spirit of the Lord hath withdrawn from you, and hath no place in you, and the devil hath all power over you; and this is the final state of the wicked" (Alma 34:35). Hence, I have more motivation to get the word out to people before they die. Further, following the golden rule, I do unto others, as I would have them do unto me. So of course I wish LDS would do what I do in front of our churches. Finally, LDS are simply whining about me being in front of their temple. I don't whine about them even coming to our homes, so why should they whine about me ministering on public property in front of their wards and temples?